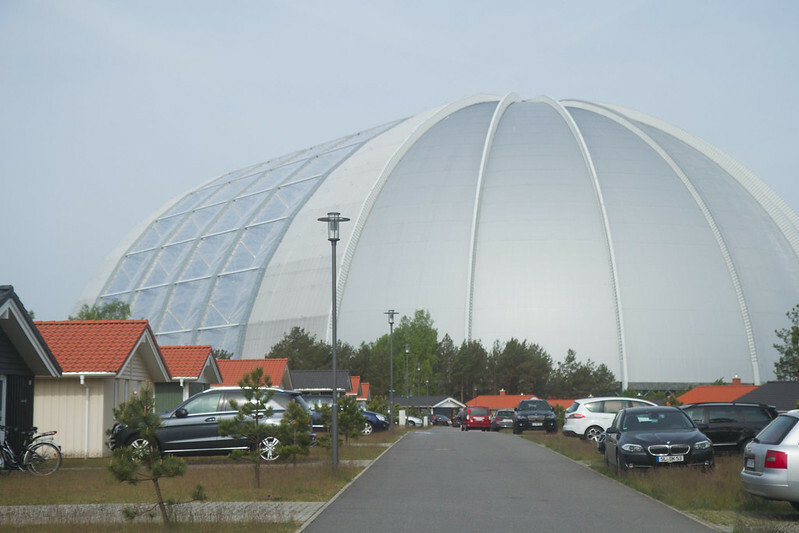 A former Soviet airfield hanger, 50 kilometres from the southern boundary of Berlin, is perhaps not the first place you’d imagine, when dreaming of a tropical paradise, a rainforest rich with diversity, the mild water glittering aquamarine, the air heavy and humid, and alive with birdsong. Nevertheless, this is exactly where Mike and I found ourselves, on a bright, but still quite brisk, May morning, standing outside one of the world’s largest buildings, 5.5 million m³ in volume, backpack laden, cameras and swimwear in hand, unsure as to quite what we should anticipate inside, but having heard stories of a surreal, and playful re-imagination of what was a disused space. 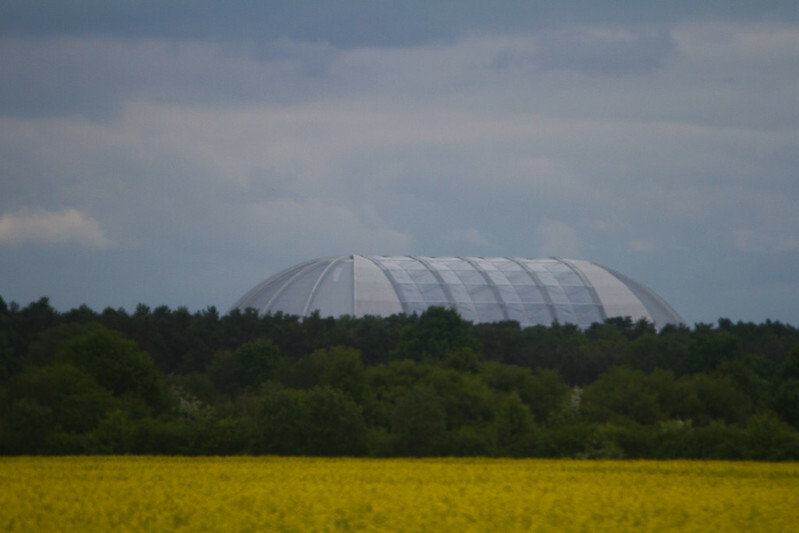 What was previously known as the Aerium Hanger loomed over us, looking something like a giant bubble or a covered city from some low budget science-fiction movie. The sheer size of the hanger was quite hard to comprehend, it rose into the sky in silver and white and reflected the sun. 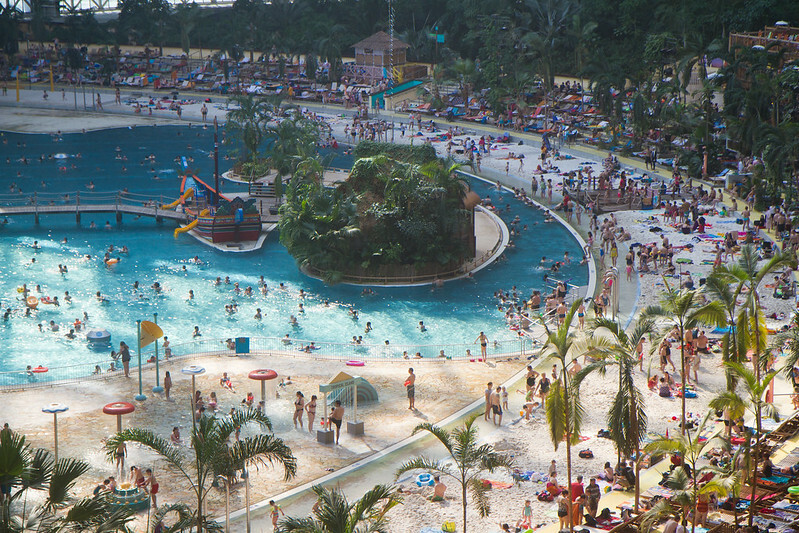 Tropical Islands was built by the Malaysian company Tanjong, and opened in December 2004. 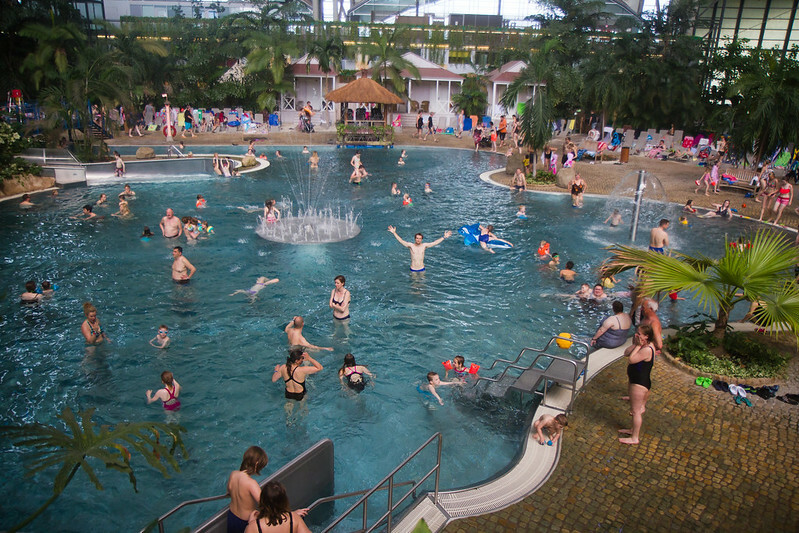 It is home to the largest indoor rainforest in the world, a beach, numerous tropical plants, swimming pools, bars, restaurants, a sauna and spa complex, and even flamingoes. The resort is open 24/7, every day of the year. When you pass through the main entrance, you are immediately hit by a wall of sound and heat. The temperature inside the hangar is maintained at a steady 26 °C (78°F), and the air humidity hovers at around 64%, which is quite the contrast to a blustery Berlin morning in the springtime. We picked up our pre-purchased wristbands, granting us entry to both the tropical world (where the waterslides are located! ), and the tropical sauna and spa complex, which comes at an additional fee. These electronic wristbands are used to buy everything inside the resort, you pay for anything you’ve bought at the end of your stay. We spent the majority of our day in the Bali Lagoon, a 1,200 square metre pool with two slides, jacuzzis, fountains, and a current canal, with a constant temperature of 32 °C (90 °F), the no-clothing-allowed sauna complex, where Mike enjoyed a relaxing mud, chocolate, and honey scrub, a crystal steam bath and we both enjoyed the whirlpools, (I hate saunas! 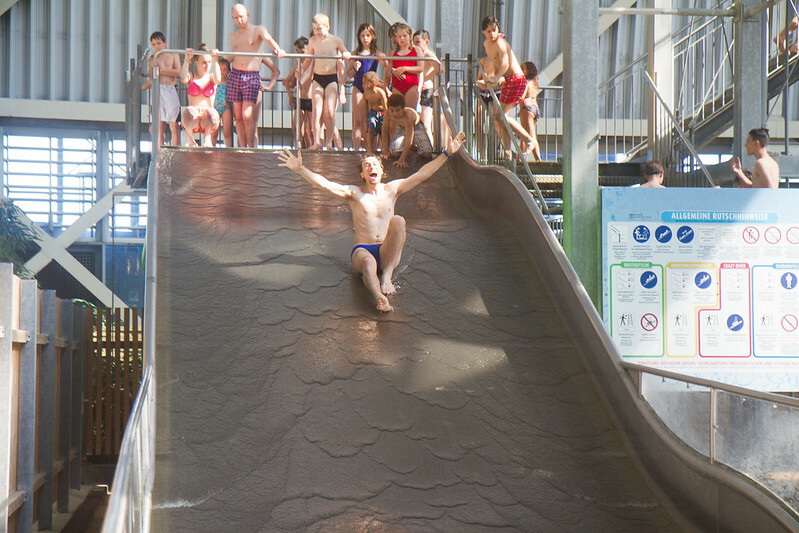 ), and queuing on the slightly wobbly waterslide tower, a 27 metre high tower that features 4 waterslides, including a leisurely family slide that twists and turns in loops, and a high speed water chute that reaches speeds of 70 kilometres per hour – which Mike braved. 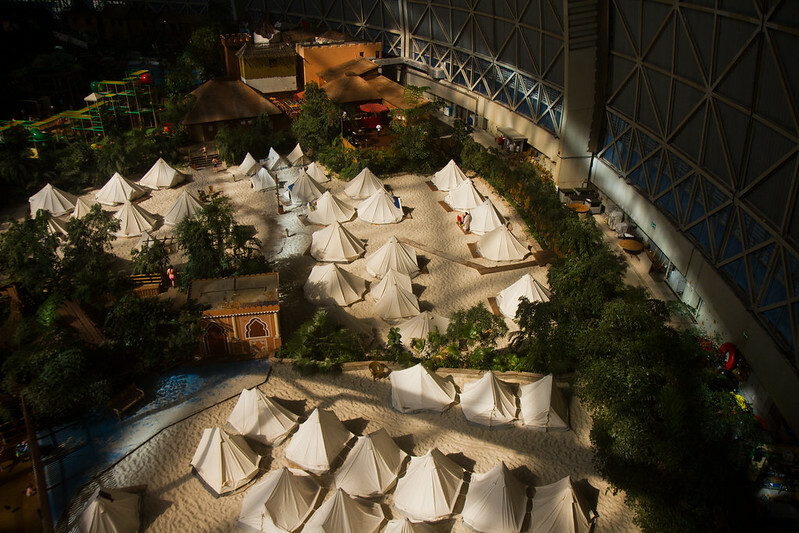 Tropical Islands also features the Tropical Village, featuring accurate copies of traditional buildings from Thailand, Borneo, Samoa and Bali. We ate a buffet meal here, at a noodle and salad bar. We found the food to be quite typical of a theme-park, in terms of quality, and rather expensive, but as food is not allowed to be brought into the resort, this is what we had. We stayed from 9am until approximately 12am, giving us approximately 15 hours at the park, at 45 euros a ticket, which for us felt like plenty of time, but for those for whom 24 hours is not enough, there are even hotel rooms and tents that can be rented. Tropical Islands was a truly unique experience. The day we arrived was a german holiday, and so the beaches and pools were rather crowded. 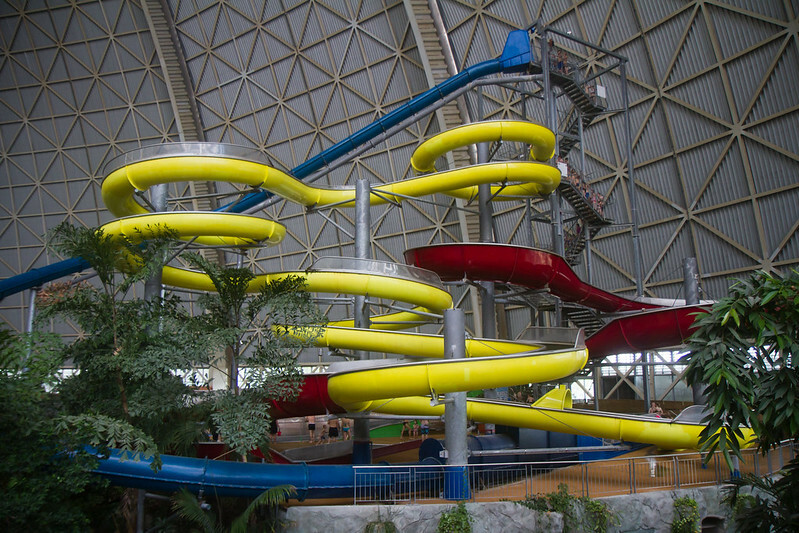 Still, with a cap of the amount of visitors allowed into the resort per day, at no point did the resort feel over-crowded, though there were some lengthy waits for the larger waterslides. We enjoyed our stay thoroughly, although by the end of the day our purses felt considerably lighter, and I think that for those with kids this would be an unforgettable day out for them. 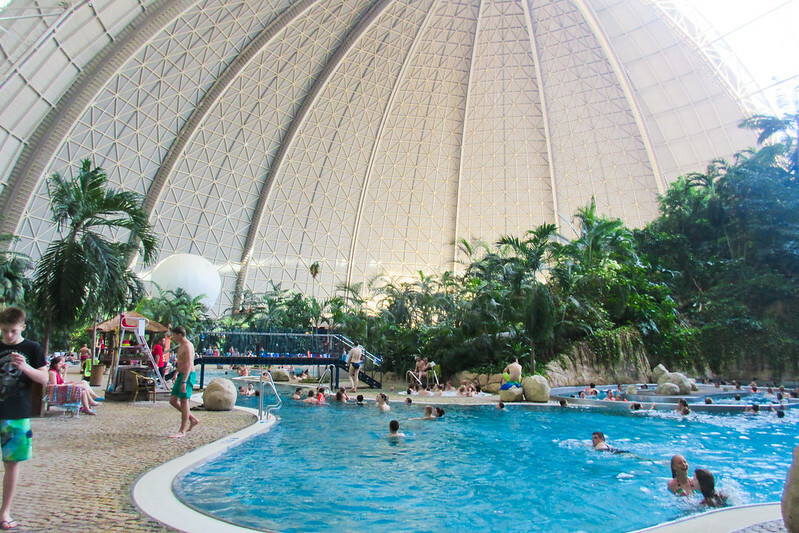 If you’re near Berlin and looking for something different and memorable, I’d for sure recommend a visit to the rainforest resort inside an airship hangar. Here’s a link to Tropical Island’s website, where you can purchase tickets. And here’s a link to our flickr set from the day.